Then cover your board with tin foil, or buy the fancy stuff. I didn't, but next time I might. Tape it on the underside so it doesn't snag on anything. Flip your board then run your finger along the drilled hole to poke your 12" dowel. Put some wood glue in the hole before putting the dowel in. Let sit overnight. Find a vanilla recipe you like. This was the longest and hardest part of the Elmo process. I started with a few recipes online, but I didn't like them enough to bake for friends and family. So the journey began, and it was a long one. 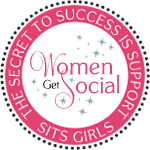 15 Cakes and cupcake recipes later my recipe was found by experimenting with every single ingredient. I made 3 more cakes for the Elmo cake. I used my Lucky Vanilla Cake recipe. I baked them all 4 days ahead of the party, cooled and froze them for one night. I would suggest making them 3 days ahead of time, 4 is not necessary except when you decide to experiment with frosting (don't!!) Check out my recipe! Take your frozen or chilled cakes and cut the domes off. I suggest drawing a line with the tip of your knife at the edge of the dome and cake wall. Then use that line to guide your knife as you cut in a circular motion, keeping your knife pointing towards the centre of the cake. I tried cutting from one side to the other and I found that method to be more difficult. Therefore, I like to cut to the centre while turning my cake. Now you'll need to cut your cake into two layers like this. Trace a line with the tip of your knife again, making sure your line is evenly in the centre of the cake wall. Cut using the same method as the cake dome. It's okay if your cakes are uneven or slightly broken or cracked. Stacking them will hide imperfection. Grab your cake board and put one layer of cake through the dowel, right in the centre of the cake. I just eyeballed it, it's okay if not perfect, you will be trimming off the sides of the cake anyway. I suggest using your best cake layer on the bottom (no cracks). Add a big layer of buttercream frosting then repeat process. You could easily put all 6 layers of cake together without a divider, but it makes for one huge slice of cake. You have to think about how you will also put it apart. I decided to place a piece of cereal box carton covered in tin foil to mark my fourth layer. If I do this again, I will probably just buy a clean piece of thick paper/carton because I accidentaly ripped a piece of foil and served it along with a piece of cake! woops! Add remaining two layers and two cake domes. In the picture, I only have one cake dome. I added the other one after I started cutting it because I felt it needed more height. Don't worry about filling the top few layers right to the edges because you'll be cutting the sides off. Grab a clean serrated knife and start cutting! I started by cutting my first top layer in the shape of a circle the size of the neck. about 2-3 inches diameter. From there, rest your knife flat on the edge of the top layer in a diagonal line and start cutting the rest of your stacked cake in the shape of a big Elmo belly. Slowly remove as much frosting as you can with the dull side of your spreading knife. This will keep the crumbs from falling and will also seal the cake's moisture when refrigerating or freezing. You can now refrigerate. It's a good idea to chill cakes with a crumb coat before frosting to make it a smoother and easier experience. I decided to frost my cake with a tasty buttercream frosting after chilling my cake with the crumb coat and before frosting with the Elmo red coast because I know the Elmo red frosting would not be edible. It's not edible when you need an entire vile of concentrated red#40 dye which taste disgusting and is very unhealthy. I bought natural food coloring from Baking Supply House or you can by IndiaTree brand in the States, which I didn't use for the Elmo cake. I wanted too, but I soon discovered that it wasn't going to work for the concentration of colour I needed. I will gladly use them though for cupcakes and cookies I will be making for the holiday season. It's a good idea to remind party guests not to eat the red frosting. I made sure to wrap the tasty frosting with plastic wrap to keep it fresh. I then chilled the cake some more. making the head, arms and legs out of Rice Crispy squares. Make a batch for the head alone, then make another batch for the legs and arms. It cools fairly quickly so I wouldn't recommend making a big batch to make all pieces at one time. Here's a picture of the arms I made. I sculpted the arms when warm and still very pliable then I put them through a cleaned coat hanger that I measured and shaped. Keep shaping your rice crispy limbs till they've cool enougth to leave alone to dry and harden. I didn't use a wire for the legs, I simply shaped them to be resting flat on the cake board. When making hands and feet, make them seperately (from the limbs) then stick together when still warm and sticky. Make the head in a football shape and leave to harden on your counter. I make the mistake of refrigerating it after it cooled and it stayed a little flexible. You don't want your head to droop on the birthday day once it's on the dowel, so I would dry overnight till it's hard. BUT make sure to pass the head onto the dowel of the cake board to make the hole before it hardens too much. Make eyes and nose seperately. I make the eyes about the size of golf ball the the nose a little bigger and longer. Make the nose flatter on one side. Leave to harden. Frost eyes and nose and leave in freezer. Don't worry about the smoothness of the frosting, you'll have to take them out of the freezer once frozen and smooth the edges with your warm hands. Assemble arms and legs, then start making your red Elmo frosting. I suggest making the frosting at least 4 hours before the party, but not days in advance. You will need at least one to two hours for the color to mature to it's true color. I was nervous at first because I couldn't get the right red for elmo when I was mixing my frosting. It was more like a tangy salmon pink. But about 2 hours later it was the perfect red colour. Use Decorative Frosting for the red Elmo frosting. Use 1 vial of red-red wilton color. Use half a bottle of regular (unconcentrated) yellow color. I also added 2 drops of burgundy wilton concentrated colouring. Assemble head, eyes and nose. Cut BBQ skewers 1/3 of the length and use to place eyes and nose in place. Make sure you've smoothed you frosting over with your hands. Apply black frosting to eyes and mouth. I suggest drawing a black line with frosting first before filling. Use a knife to smooth it out, or dont' (like I did). I bought the black frosting because the store I went to was out of black coloring. Chill your frosting slightly before decorating with the red frosting. I used a star shaped end. Start at the feet and work your way up. Always work from the bottom up, that way the fur will look for realistic. Also, it's nice if you can move the furs direction from time to time. Make one layer of fur then make another layer on top. Also make sure to decorate the entire front the Elmo before moving to the back in case you run out of frosting (like I did) if you know you won't have time to mix more. Remember, it will take a couple of hours for the colour to set, so if you start decorating the cake a couple of hours before the party and you run out, you won't be able to fix it. If you finish the front and happen to run out of frosting for the back, use what you have left by spreading the frosting on. It will still look red, it just won't have the nice details. If you've made lots of frosting, or you're decorating elmo the night before than you are much better than me! Now I know to make this cake ahead of time, but sometimes life happens and you just can't prepare it earlier. 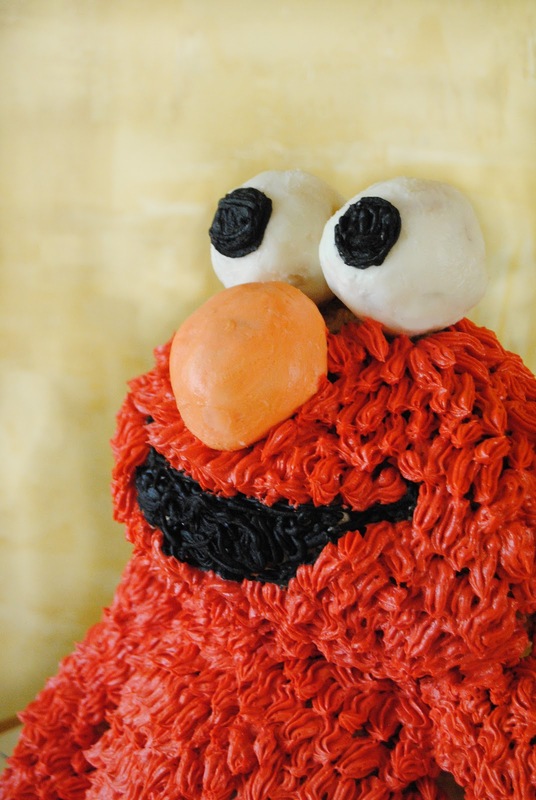 A complete 3D Gluten-free Elmo!! Click HERE for my Lucky Vanilla Cake recipe. It's a good one, so give it a try! I also made a smaller round cake to place between his legs for the candle. Also make sure to clean off your cake board. I was one of the privileged ones who got to see and taste the cake in person! It was absolutely amazing! 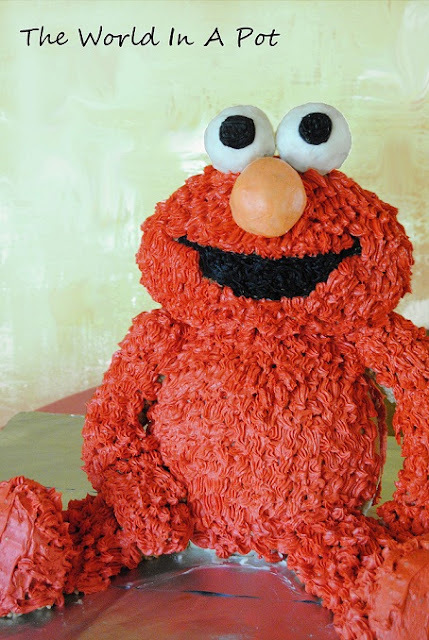 It takes at true artist to make a 3D elmo cake that looked like it was about to come to life! And to top it off, the cake tasted wonderful!! Truly talented!! What size cakes did you bake? I used my 9' round pans for all layers. Wow! what an amazing job you've done!! That's a lot of work- incredible! Wish I could do this! looks wonderful! That's an amazing cake! Hope the little one loved it. Wow, I'm in awe, what a beautiful cake! You have talent. Looks like lots of work, but well worth it, beautiful cake! It looks great, thanks for posting your process.